Join us as we sing the national anthem for the Lancaster JetHawks vs Lake Elsinore Storm on Friday, June 8th. We are on the field at 6:00PM. It's Princesses in the Park/ Villains Night. If you would like to join us, please let us know as we are selling tickets as a fundraiser as well. We hope to see you there!! Do we dare take a evil spin on our beloved Princesses Night?! You absolutely know it!!! Come dressed as your favorite Villain, and take part in all of the devilish fun! Plus trick-or-treat throughout the concourse! On June 2nd, Antelope Valley Showcase Chorus will be celebrating our Veterans and Military with our Tribute to America Show. We will be singing, in Barbershop Style, patriotic and other Americana music. Female Singers ... Love to sing Patriotic Songs? Become a part of our Guest Chorus and sing with us at our Tribute to America Show. Rehearsals start April 24th through May 29th. The Patriotic Show is on Saturday, June 2nd. Time and location to be posted soon. Join us for the FUN singing opportunity under the direction of our director, Janice Kueppers. We love to have visitors, so please, come and enjoy an evening of singing... and maybe get the bug to join us. Female Singers ... Love to sing Christmas Songs? Become a part of our Guest Chorus and sing with us at our Annual Christmas Show. The Christmas Show is on Saturday, December 2nd at 2:00 PM at Sonrise Baptist Church in Palmdale. 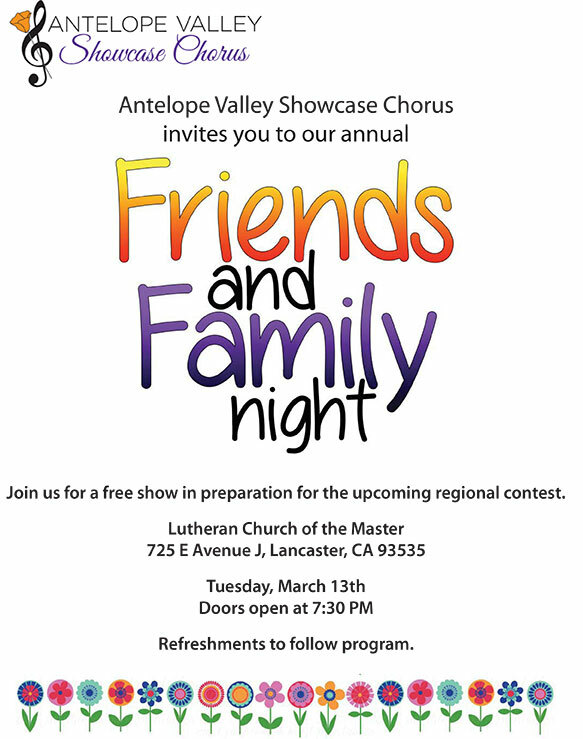 Join Antelope Valley Showcase Chorus for That's Entertainment for some beautiful a capella music. Special guests include Verdugo Hills Chorus, and quartets: Makin' Mischief Region 11 3rd place medalists, BBnJ Region 11 current novice quartet champion, Sweet Serenade, current double quartet champions The Castaways, Valkyries Young Woman in Harmony Quartet, double quartets, and Palmdale High School Chamber Singers. Antelope Valley Showcase Chorus, the valley's premier women's a cappella chorus, announces that Janice Kueppers has been appointed as our new director. Janice comes to AVSC since retiring from LAUSD after working for 21 years as a vocal music teacher of grades 6-8. Among her directing credits are director of Christ Lutheran Church choir in Valencia for 12 years, director of Harmony Hills men's barbershop chorus in Newhall for 1 year and associate director of Verdugo Hills chorus in Glendale for 18 years. She is a certified director of Sweet Adelines International. Janice is the Young Woman in Harmony Coordinator for Region 11 Sweet Adelines and helps to promote singing events for young women to introduce them to the art of barbershop.